When adjusting color in an image you have three tools; Tint and Temperature or RGB Curves. Think of the Temperature and Tint sliders as the quick and easy method to change color and RGB curves as the precise method. Remember on our Color Wheel we said that adding opposites colors gives white light? Cyan and Yellow are opposites. Dragging it right (higher in temperature) corresponds to a overcast day. It increases the luminance of Red and Green pixels and decreases the luminance of blue pixels. This moves the color in the yellow direction. This is great if your captured pixels were tending to be too blue as in an overcast blue day. This laid out on your screen first because it makes sense to adjust it first. It is able to fix incandescent or outdoor light color cast issues. Use when you have a neutral grey object in the shot or a reference shot to set the WB. Use to fine tune Cyan to Yellow adjustments. Use when you have a skin tone in the shot to set the WB. Use for fine tune Cyan to Yellow adjustments. To Remember: If you see cold (magenta) or warm (yellow) casts fix it with the Temperature Slider. The second slider, adjusts on the Green to Magenta scale. It’s second to temperature (and absent in two Aperture 3 modes) because color casts in this direction are less common. Color casts in this direction occur generally because gas based lights were used or when White Balance is left in AWB and there was a lot of green in the shot. Gas based lightbulbs can emit nearly any light. Older Fluorescents were known for their green hues. To Remember: If you see green or pink hues (easiest to see in the hair) slide the Tint slider in the opposite direction. Think of these as the precision control for color. 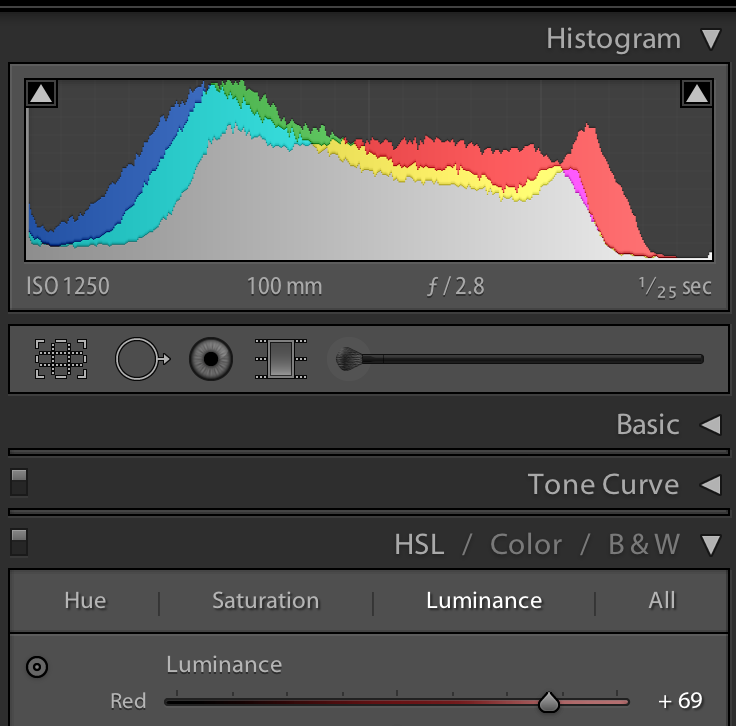 Aperture 3: You get the full power of the histogram at your disposal for color corrections. If you know the Color Wheel and the effect on color by adding or subtracting light then this method is much preferred. It’s also powerful when color casts exist only in certain tones. The histogram is just a line graph for each color. The X-axis is the tone. The number of those pixels in the shoot is the height of that line. Lightroom 4: Select the color you want and change it’s hue, saturation and luminance. They use the word hue just to use a different word then color. Think of hue as the slider that spins around the color wheel. 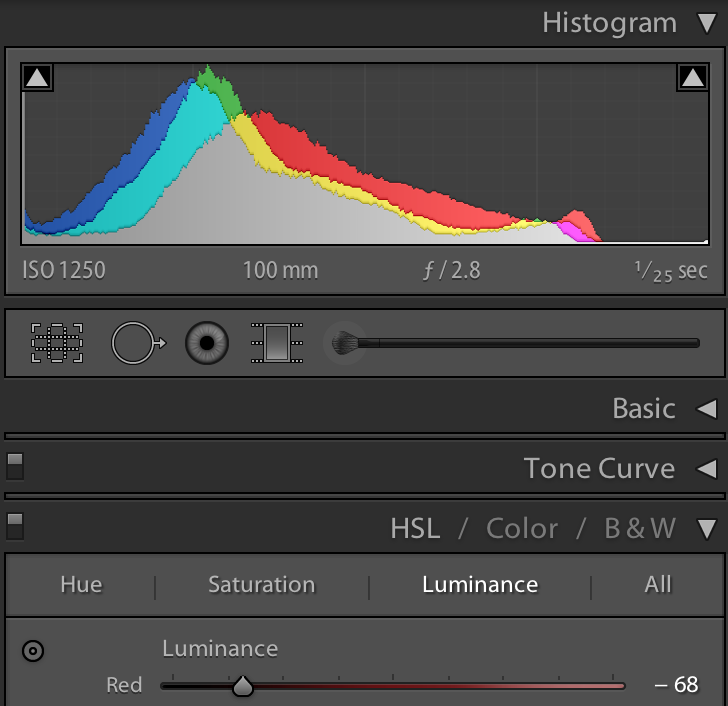 Think of luminance (brightness) as the slider for moving that color left or right on the histogram. Saturation slide takes the color out from a certain color without changing its luminance. Back to Post Processing page.